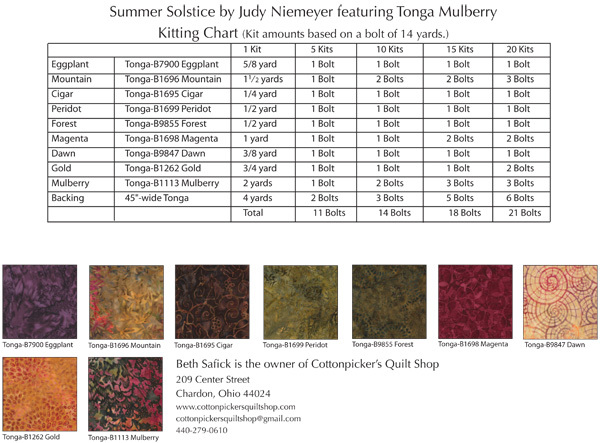 The Summer Solstice was designed by Bradley and Judy Niemeyer. 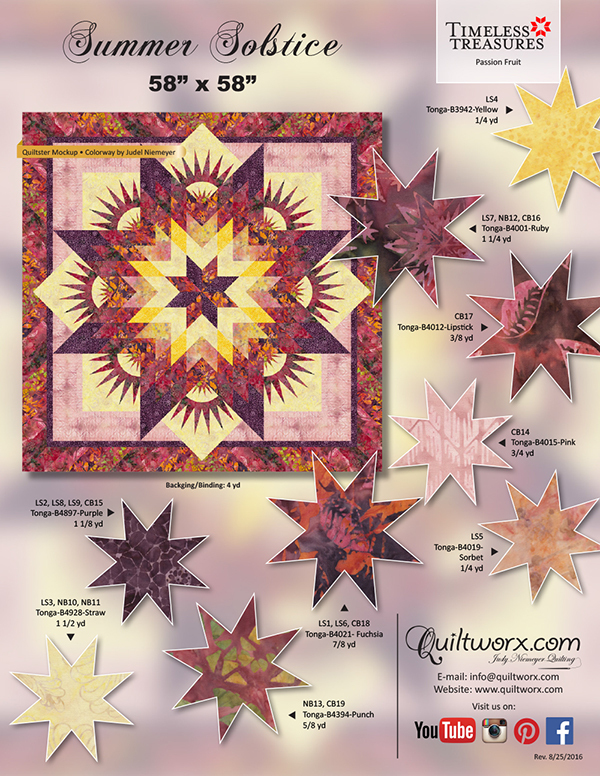 These instructions teach a strip piecing technique that expands on our traditional foundation paper piecing approach to complete lone star units. 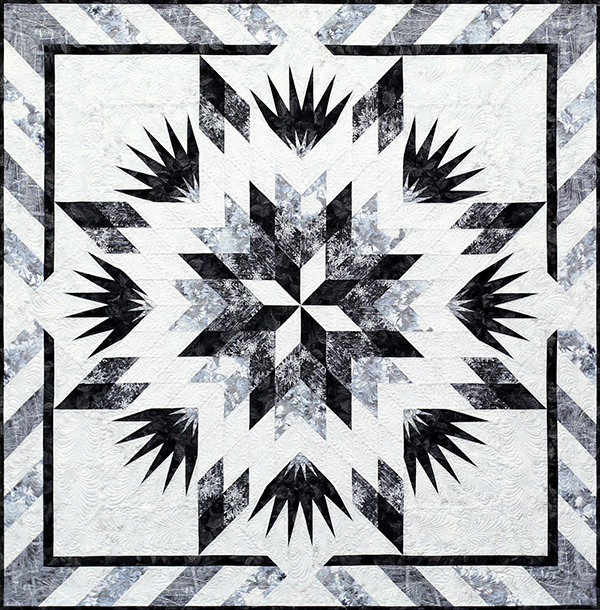 Strips are sewn onto foundation paper to complete what we call a ‘Strip Set’. After the strip sets are completed, they are cut apart, rearranged, and resewn into a diamond star point. 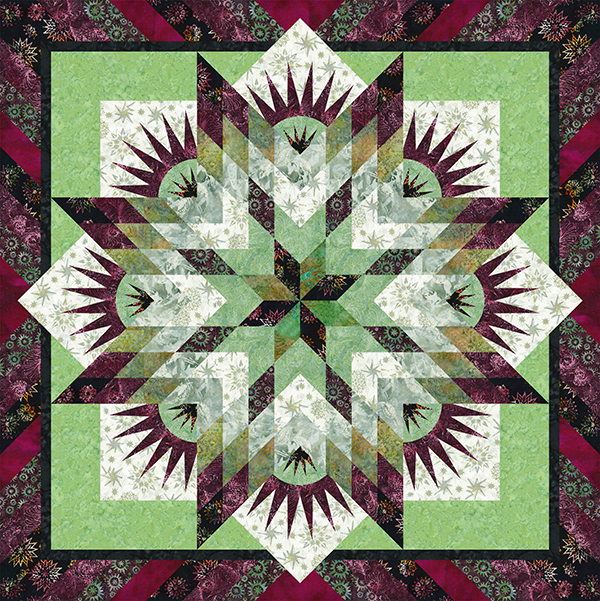 The technique evolved from seeing some common assembly approaches between the Summer Solstice and Bali Fever Backgrounds. 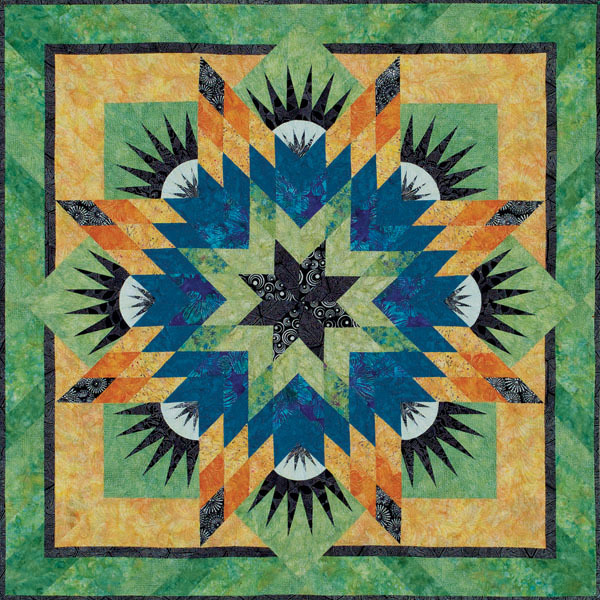 Judy began experimenting with ways to speed up the creation of a lone star block with a strip to eliminate cutting, while also minimizing fabric waste. 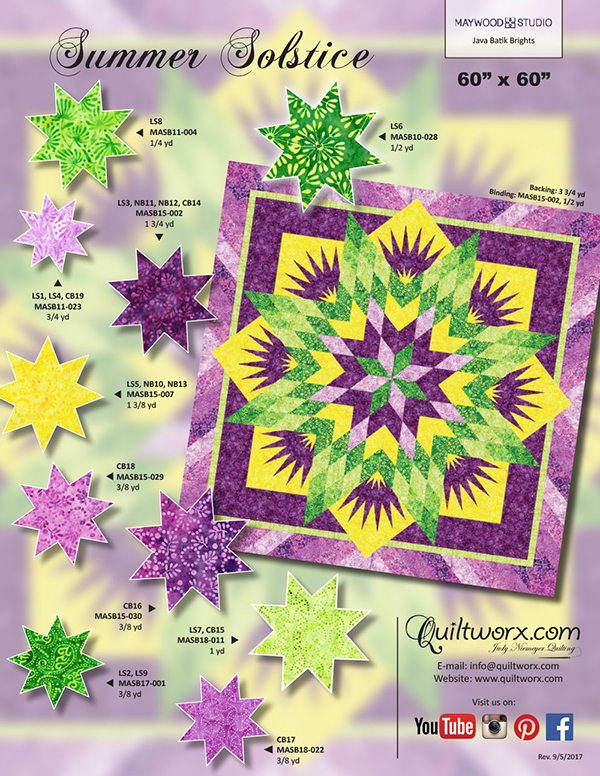 The Summer Solstice star was designed using 3” strips for the strip piecing. 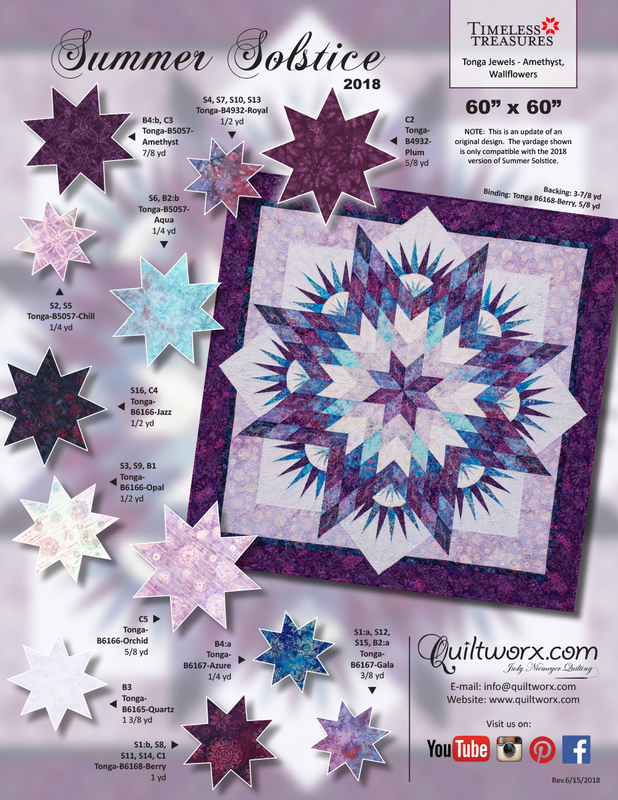 It incorporates a paper pieced New York Beauty (NYB) block and the general assembly process was designed with no Y-Seams. 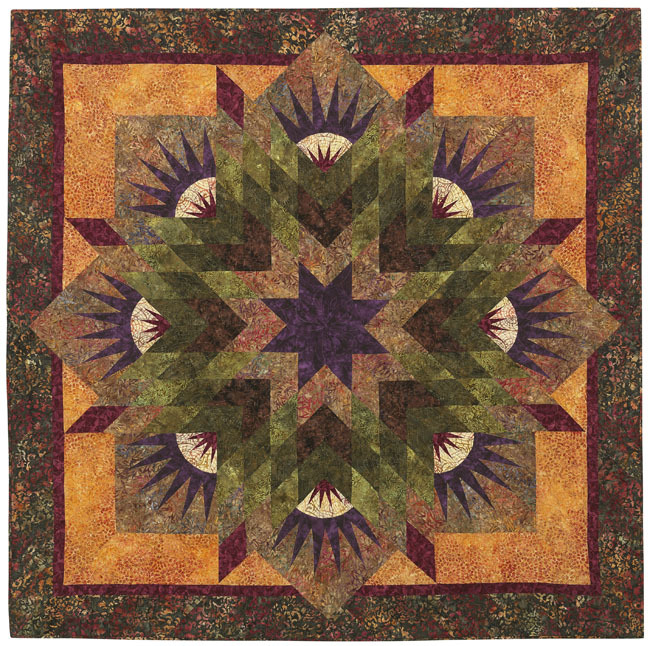 It uses yardage very efficiently at just over 7 yards of fabric for the top. 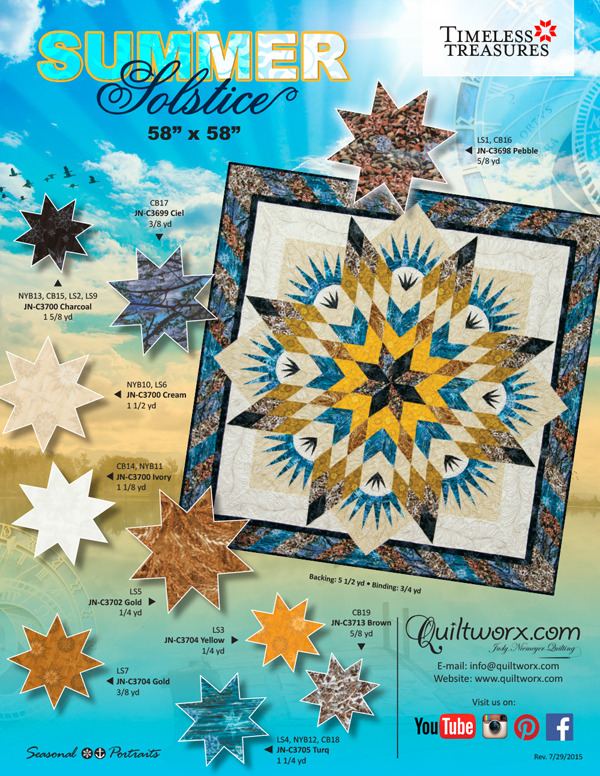 NOTE: The original version of Summer Solstice is out of print and the new one references a different Quiltster Template and is not compatible with the old pattern. 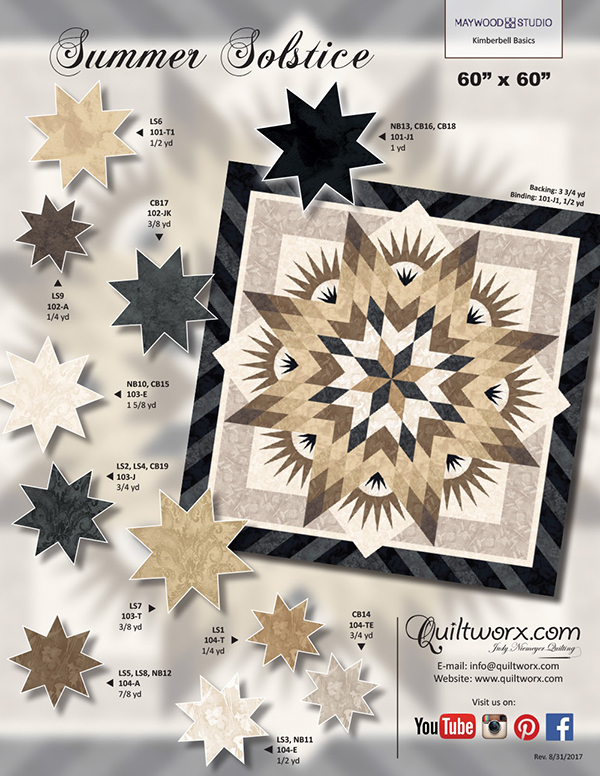 Unit Names and Fabric References have changed as these units can now be mixed and matched with many others in our pattern inventory and we needed to make everything consistent. 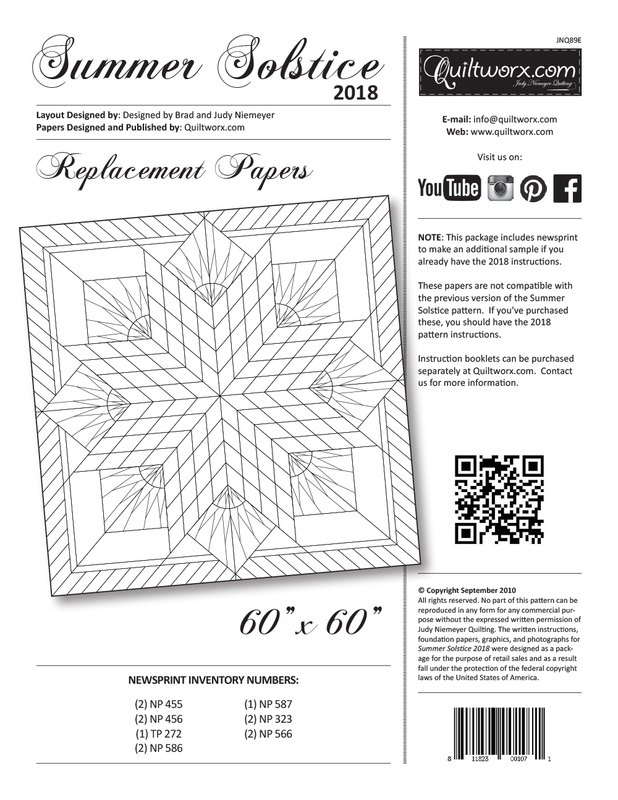 You will need to purchase a new pattern if you want replacement papers for the old design as we don’t have any of the original papers left. 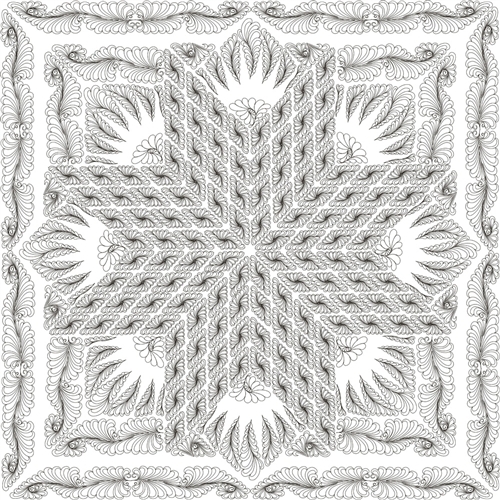 ~ Thank you for understanding! 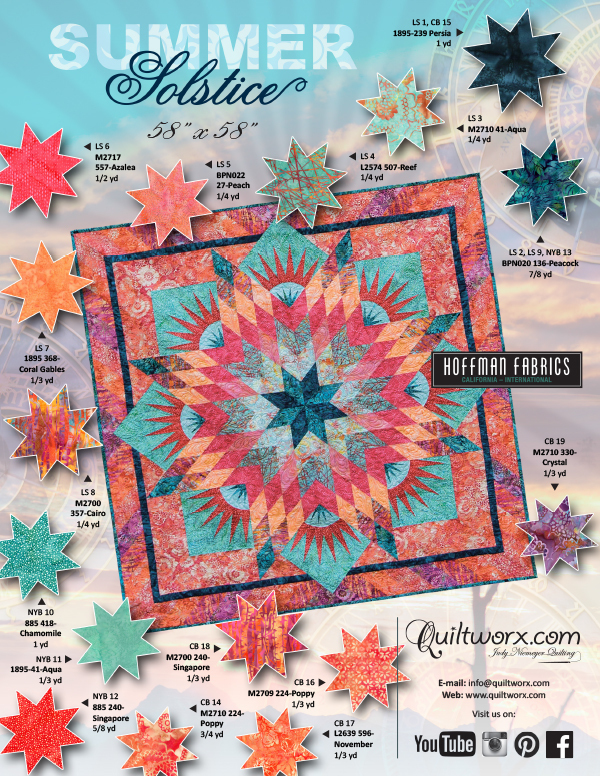 2018 Summer Solstice Quiltster Template: This pattern is Quiltster Compatible! 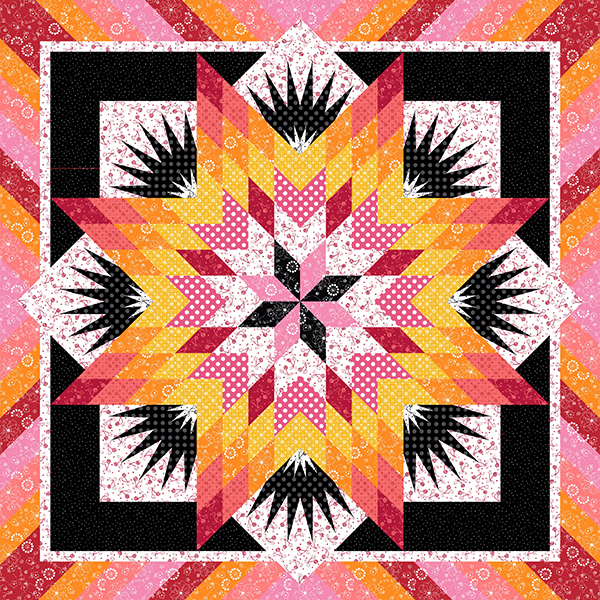 This means you can color the quilt with your favorite Fabric Collection in Quiltster before you make it and obtain yardage! 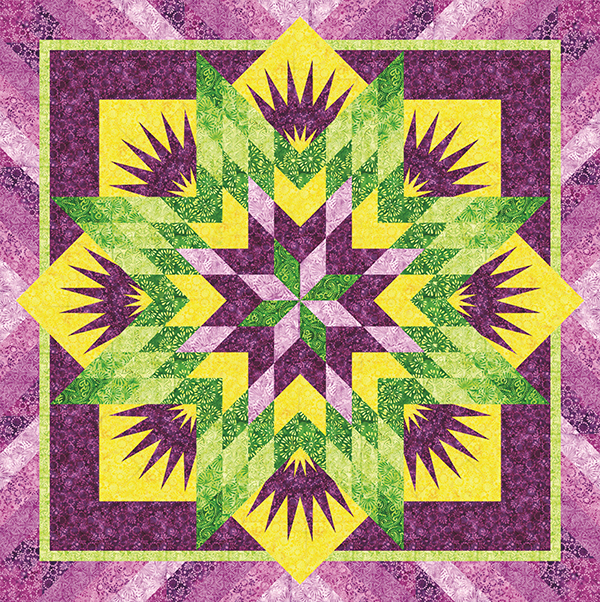 Click on the logo to the left to be taken directly to the Template page for this design in Quiltster. 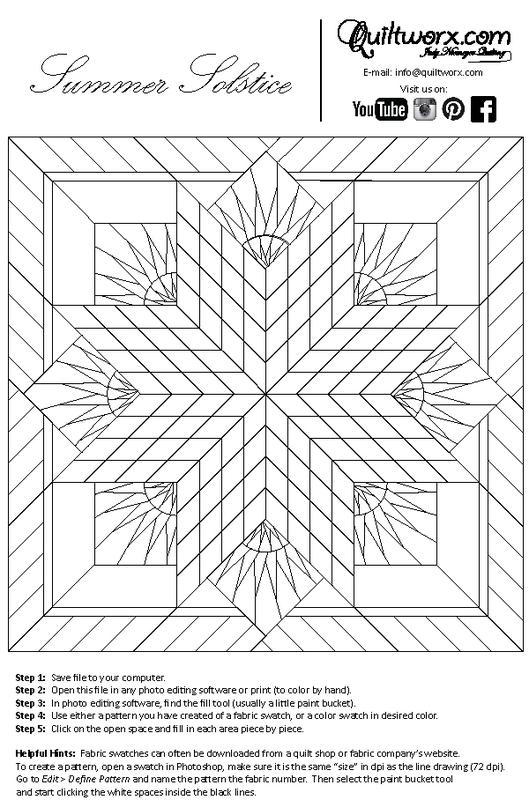 You may need to log into your account for the link to work. 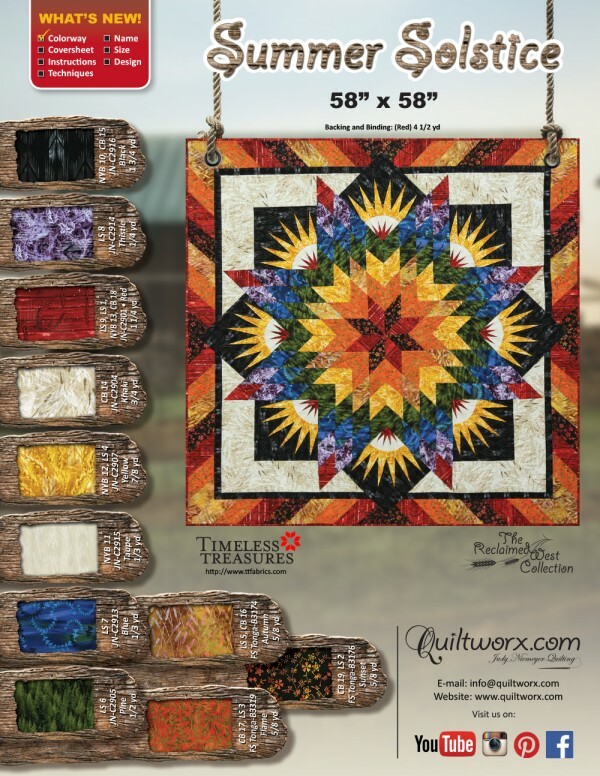 If you do not have a Quiltster account already, you will need to subscribe and log in before this link will work. 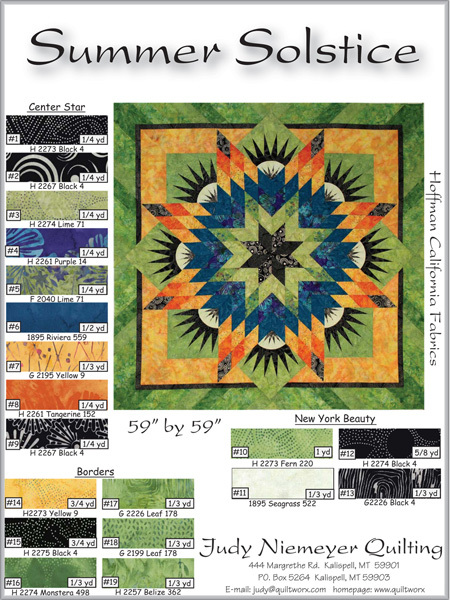 Subscriptions can be obtained by going to http://www.quiltster.com, click on Subscribe! 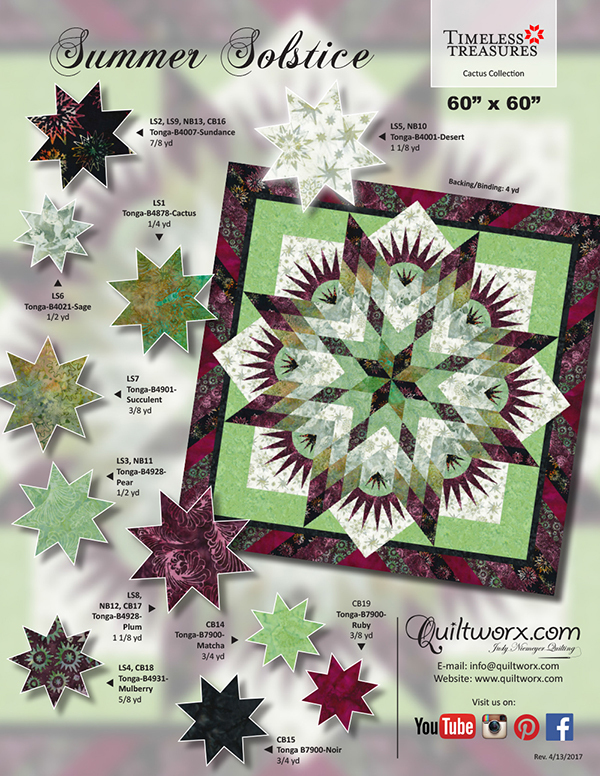 Original Summer Solstice Quiltster Template: This pattern is Quiltster Compatible! 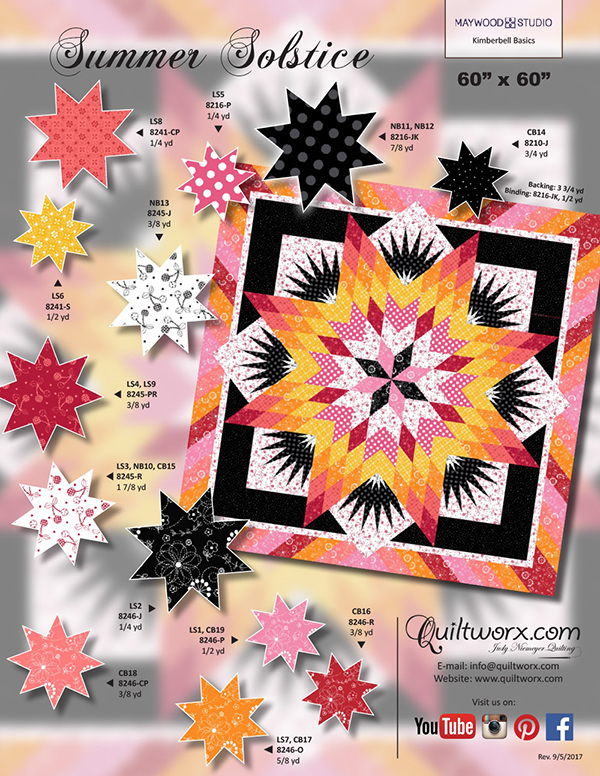 This means you can color the quilt with your favorite Fabric Collection in Quiltster before you make it and obtain yardage! 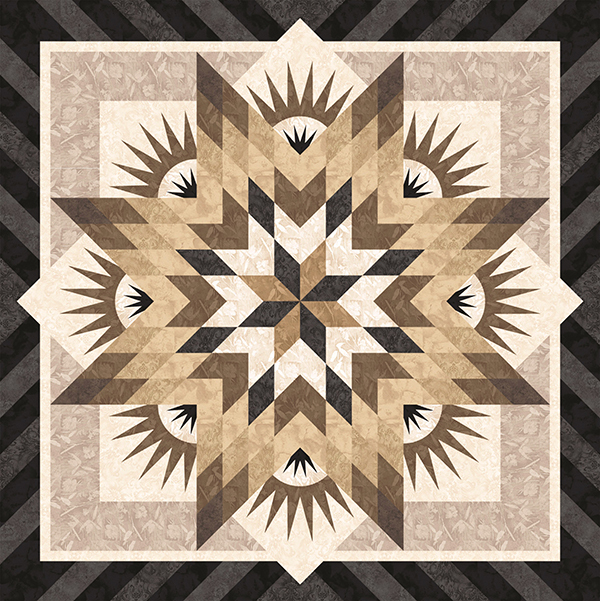 Click on the logo to the left to be taken directly to the Template page for this design in Quiltster. 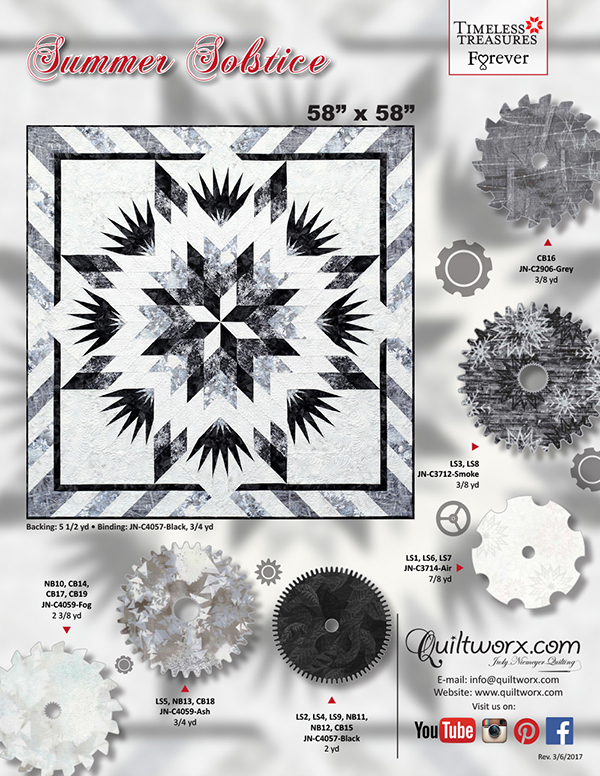 You may need to log into your account for the link to work. 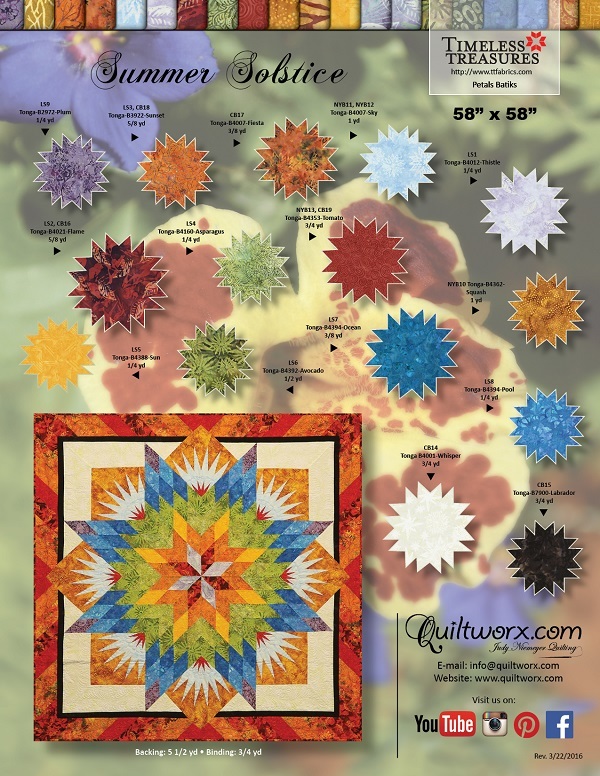 If you do not have a Quiltster account already, you will need to subscribe and log in before this link will work. 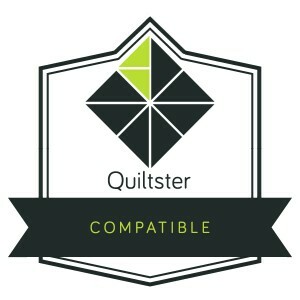 Subscriptions can be obtained by going to http://www.quiltster.com, click on Subscribe! 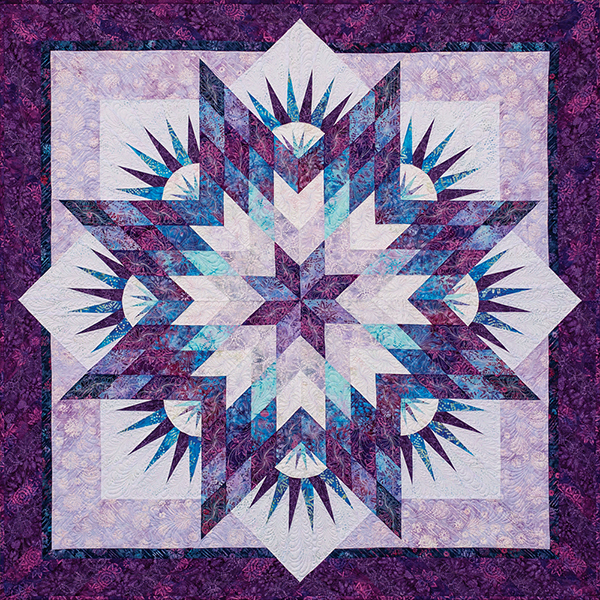 Summer Solstice with Glacier Star Queen Expansion Package, designed by Quiltworx.com, made by Ginger Adams. 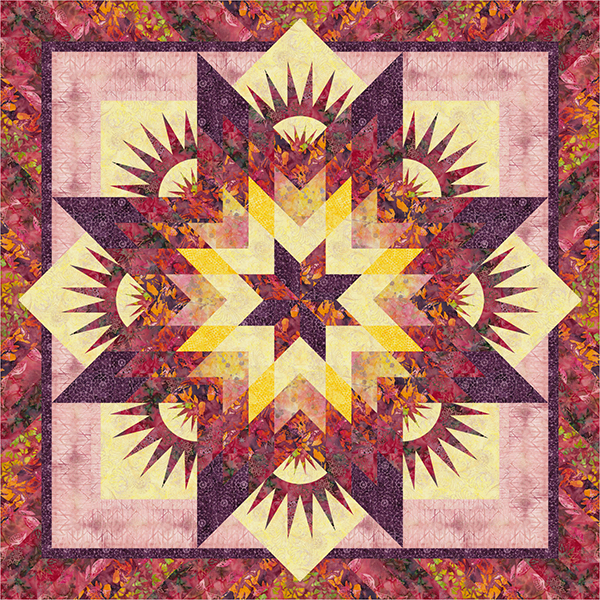 Summer Solstice, designed by Quiltworx.com, made by JoAnne R, quilted by Jeannie Rogers of In the Pink Quilting. 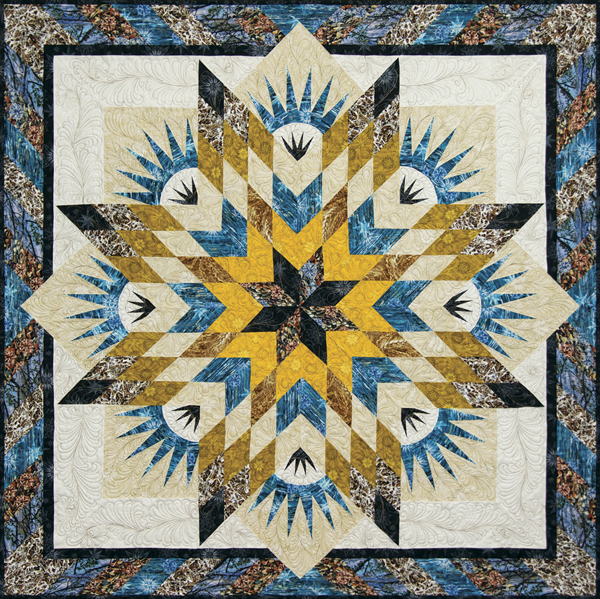 Won 3rd place ribbon in the Foundation Paper Piecing category at the Arizona Quilters Guild 2018 Show, First Place for Foundation Paper Piecing plus it won the NACQJ Award of Merit in Quiltmaking at the 2018 Rim Country Quilt Roundup in Payson, AZ. 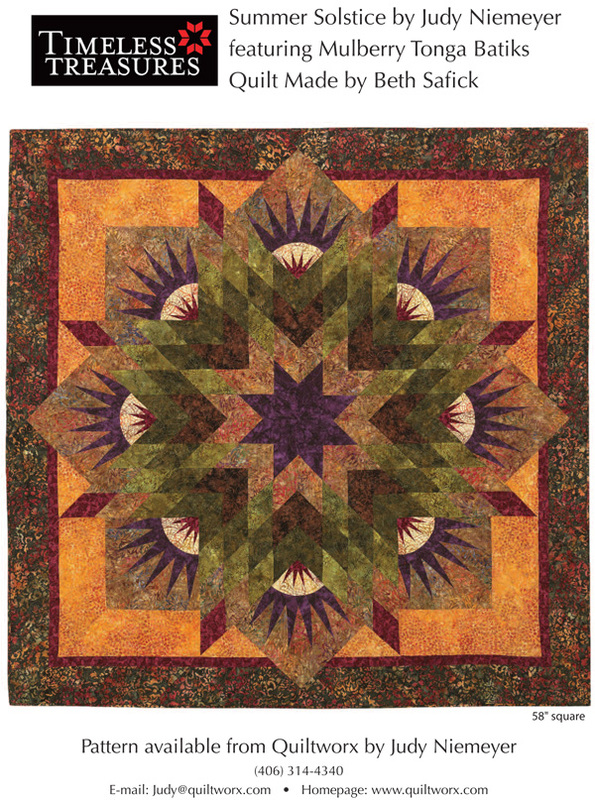 Adam Are Nancy Sharp Sandy Alberts for retreat?